In 2018, TSI launched the Future Industrial Hygiene and Safety Leaders Program in partnership with the American Industrial Hygiene Association (AIHA) and the American Industrial Hygiene Foundation (AIHF). TSI invited colleges and universities with ABET-accredited academic programs in industrial hygiene or occupational health & safety to participate in a limited donation program. ABET-accredited schools with programs in occupational health and safety or industrial hygiene are invited to apply to the program. The Future Industrial Hygiene and Safety Leaders Program provides eligible academic programs with PortaCount® Respirator Fit Testers. Since then, ninetten schools have received PortaCount respirator fit testing equipment. 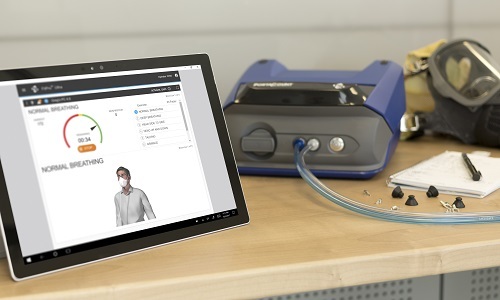 Students use the PortaCount® Respirator Fit Testers to practice quantitative respirator fit testing and prepare for real-life respiratory protection challenges. 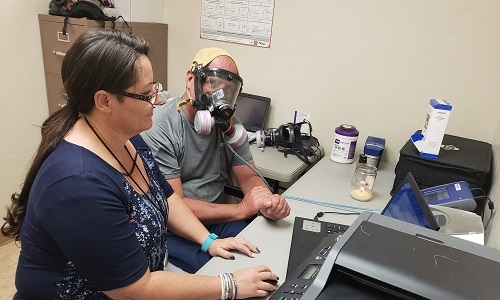 Professors Pete Raynor and Debbie Brown in the University of Minnesota School of Public Health, Division of Environmental Sciences, accepted a donation of Portacount respirator fit testing equipment for their program. They plan to use their new respirator fit testing equipment for teaching and research in the School of Public Health program. Dr. Marty Cohen, Industrial Hygiene Program, Field Research and Consultation Group, Department of Environmental and Occupational Health Sciences, University of Washington, and graduate students from the Industrial Hygiene program. This photo was taken at AIHce 2018, American Industrial Hygiene Conference & Exposition in Philadelphia, PA.
Dr. Gurumurthy Ramachandaran, Bloomberg School of Public Health, Johns Hopkins University, accepted PortaCount respirator fit testing equipment from TSI on behalf of Johns Hopkins, writing, "Thank you very much for this offer of a donation of the Portacount Respirator Fit Tester (Model 8038). I am thrilled to accept this generous offer. It will help our students significantly in the industrial hygiene lab course that is required of all our Masters students." "This is an incredibly generous offer and we are very excited by the prospect of receiving a PortaCount to use within our program. I believe that we would benefit tremendously from such a donation ... we have several classes dedicated to training students on the principles of industrial hygiene and instrumentation/equipment, where the PortaCount would be a welcomed addition." Dr. Joshua W. Schaeffer, Assistant Professor in the Department of Environmental and Radiological Health Sciences at Colorado State University. "I want to take this opportunity to thank you for the generous donation of the PortaCount® Respirator Fit Tester Model 8038. We are very grateful for your donation and honored to participate in the TSI Future Industrial Hygiene and Safety Leaders Program. This partnership between AIHA/AIHF and TSI clearly demonstrates your commitment to the future trailblazers in the Industrial Hygiene and Safety fields. "We currently have an active learning safety lab that students in our undergraduate Occupational Safety and Health program typically complete in their junior year of study. In addition, we have a 3 credit course in our Industrial Hygiene graduate program dedicated to respiratory protection. The PortaCount will substantially strengthen the quality of active learning exercises in both of these courses. In addition, we anticipate the development of graduate research related to the instrument. While we have used PortaCount instruments in these courses and in research historically, this donation will ensure that students are adequately prepared for professional positions and have experience with up-to-date equipment ... Thank you again for your generous gift." Julie F. Hart, PhD CIH, Department Chair and Professor, Safety, Health and Industrial Hygiene, Montana Tech of the University of Montana. It has been quite a project getting the PortaCount all set up and working. Our new BSEH Program Director, Dr. Sean Banaee, CIH, CSP, took the lead and got the unit prepared for the lab demo. “He used it during IH Sampling Methods Laboratory course and demonstrated it to the students. Dr. Banaee provided a PP brief on respirators and fit testing, and then they participated in the demo. They took turns wearing the probed masks, and then they administered the test to their classmates. We even had one student with a beard that we used to show that you can't get a good fit—the evidence was obvious on the test data. “The students were briefed on the software and the features. We used their names and showed them how to prepare reports. One student lamented that they sure could have used that unit during her internship working in safety at a local shipyard last summer! The students also saw our qualitative kits and are convinced that any company with any number of workers in respirators need to use the quantitative method. “I included some photos of the lab sessions. One student is reading the Rainbow Passage, and the fellow with the beard is looking a bit cynical! It was a good session. “We will be using the PortaCount again in October during our Principles of OSH course. The instructor will demonstrate the unit during class, along with our other qualitative fit test kits. “Again, we are very grateful for the donation of the unit and will get many good hours of laboratory use and student research. On behalf of the Safety Management Dept. at Slippery Rock University, I would like to Thank you for your donation of the PortaCount Fit Tester. Our students recently utilized the unit and received hands-on experience on the functions and benefits this equipment provides, especially upon graduation and working as a professional. The students expressed their gratitude for the equipment and their desire to learn more about TSI products. What do customers say about PortaCount? Professionals in Occupational Health & Safety, Industrial Hygiene, Emergency Response, and Healthcare have relied on TSI’s PortaCount respirator fit testing products since 1987. No other respirator fit tester can quantitatively fit test all types of respirators-gas masks, SCBAs, respirators, even N95, P1 and P2 disposable (filtering-facepiece) respirators.